What: Goalkeeper (GK) and back 3 unable to play out ball from the back when GK has possession. 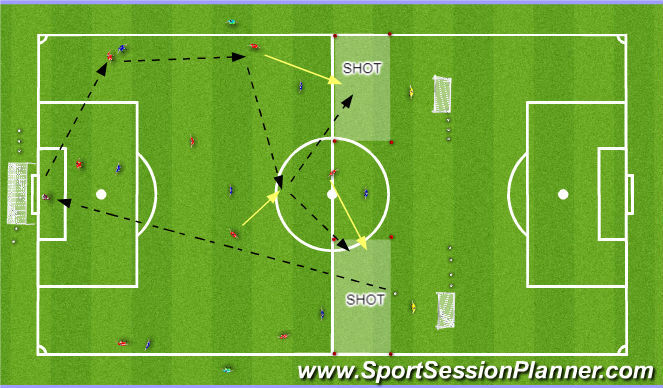 Session Objective: I aim to improve….. My Teams ability to play out from the back in when our GK has the ball. Our aim is to keep possession and build up play through better positioning of our #2,#3 &,#5 who will combine with our #6 & #8. Team Task: To maximise the total width of the pitch in structured build up from the back, make field as big as possible when GK has ball, creating space for our backs to combine with our #6 & #8. 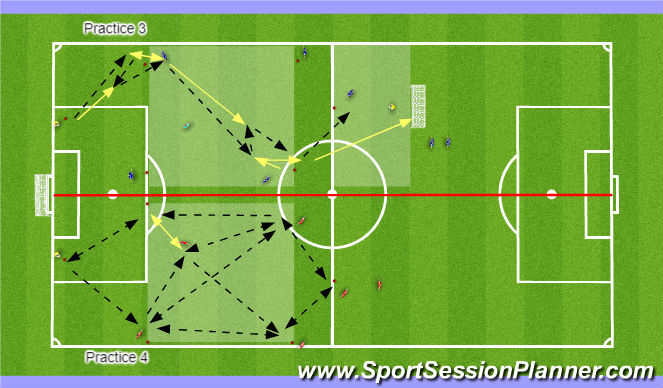 * #3 to move across the box to move the attackers. * #6 & #8 to create they work space, check off away from defensive. 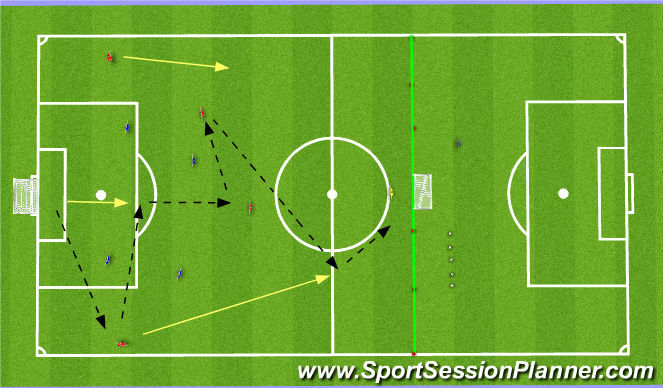 * #2, #3, #5 to recognize that if they are getting pressed to one side, a quick switch to opposite side will create overloads or 1v1’s switched side. * GK to offer support option if there is a defensive block, if GK receives ball, look to switch play asap. 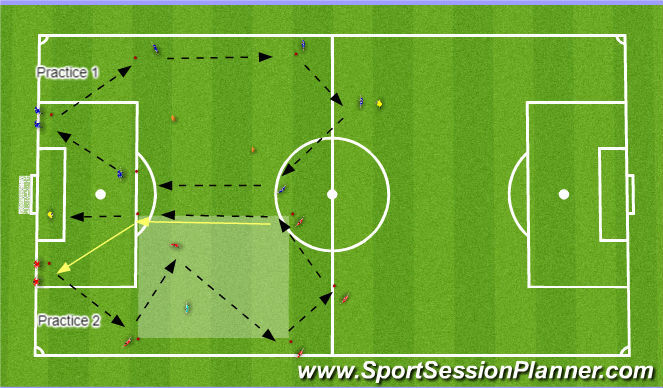 * #9 to create space for the wide players by running off the ball, checking in and checking out, be in position to create 1v1s or 2v1s. * 10 players per side. * Play starts from by line and passes to #5 and follows the pass. (left and right direction) sequence follows as per diagram 1. - Introduce 1-2 combinations in the shaded area. All players in the shaded area to touch the ball before hitting the #9 up top. Follow your pass. Move "QUICKLY" into position ready for the next pass. - Running movements as per diagram. -Ball must be player diagonally across the shaded area. - Mirror image other side. - Can we hit our #9 as quick as possible. -Once the RED scores the last player on the RED drops off behind the goal. -BLUE then start from the by-line and overload goes with the BLUE team. -Should the BLUE win the ball and score = double points. -The 4 defenders (blue) are all inside and we have a 5v4 (+1) situation. -Eliminate or reduce long 50/50 balls with the aim to retain possession and play out from the back. -Maintain balance of shape on the pitch, if the right side receives the ball wide, then the left side should tuck in and vice versa. - Play always starts from the BLUE end, either GK can knock the ball to start the play. RED team has to move it position quickly ready to recieve the ball from GK.